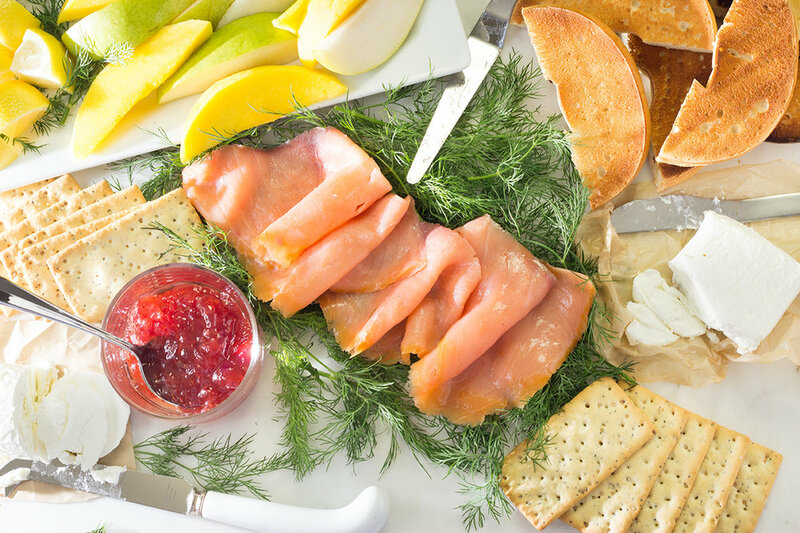 Assembling an appetizer tray is almost as much fun as sampling its delicious treats. 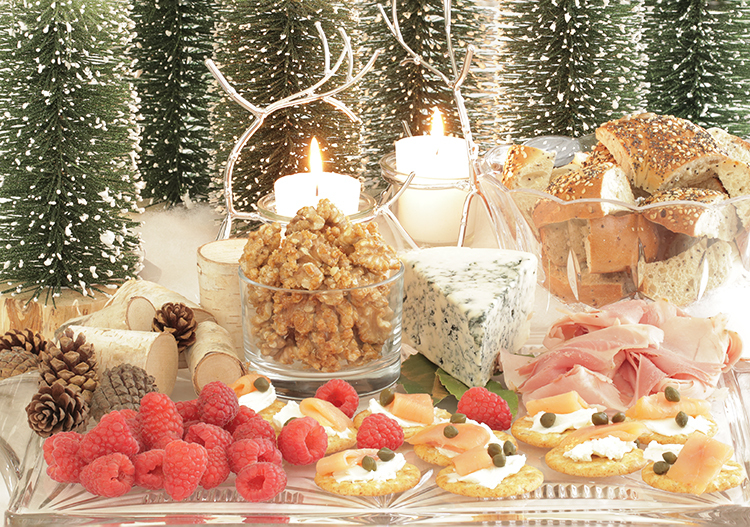 Many appetizer trays are designed to host a large group of people. If, however, you’ve read some of my other posts, you know I focus on small appetizer trays and small cheese and meat boards. I call it the wonderful perks of small space living. I find that I tend to explore and experiment more when I’m making selections for a small appetizer tray and cheese board, as I did in the holiday small appetizer tray above. Most likely this doesn’t need to be said but I will anyway—to be sure we’re all on the same page. 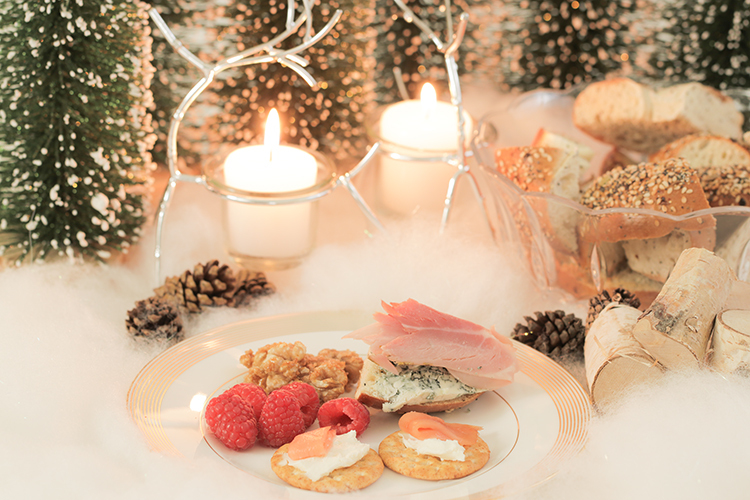 When designing a holiday or even a special occasion, include theme elements. Here I used artificial white-tipped Christmas trees, silver reindeer tea candles, and an assortment of pine cones and logs. The entire spread sits on a bed of artificial sparkling snow made of 100% polyester fiber. Replace the blue cheese with a herb-flavored butter to spread on the bagel. You can easily make your own. Just allow the butter to soften, mix in your favorite herb, preferably fresh but dry will do as well. Refrigerate the butter and allow the herbs to saturate it. Rather than everything bagle, use a cheese bagel. Use fresh strawberries, blackberries or seedless grapes in place of the raspberries. You may also be interested in cheese and meat boards. You’ll find the post at The Making of Small Cheese and And Meat Boards.